The Service Automation Framework (SAF) certification scheme supports the publication of the Service Automation Framework Alliances (SAFA) guide, ‘Service Automation Framework, for the design and delivery of automated services.’ The SAF guidance, one of the first to address this concept, provides a deep insight into the theory and methods of Service Automation, the concept by which any organization can automate its services, ‘go digital’ and enable them to offer self-service applications to their customers. 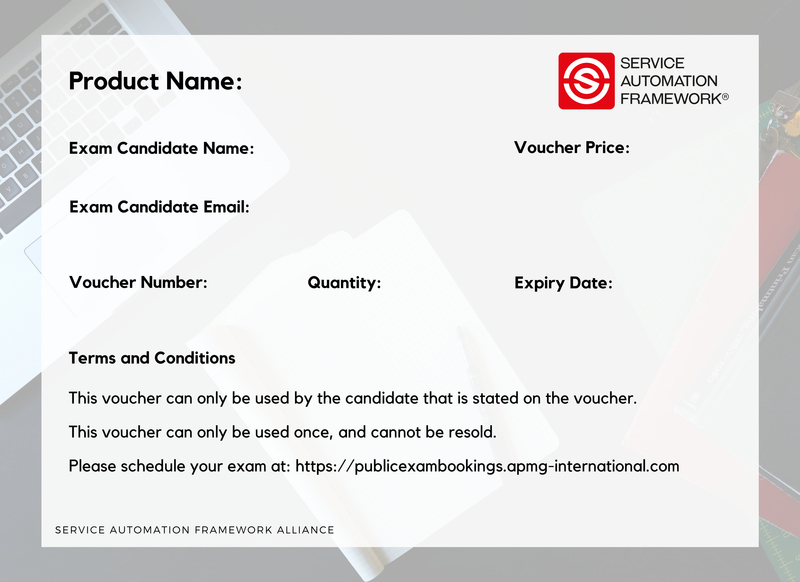 On this page, you can purchase the official exam vouchers, with which you can take the Service Automation Foundation exam. The methodology is applicable across all industries and sectors. By becoming certified individuals will understand the steps necessary to digitize the service offering of organizations and will be able to use the 7 Service Automation Framework Techniques in practice. The key benefit of the course and certification is that it provides individuals with practical tools that can be used in practice. For organizations, there are two main benefits to adopting the SAF methodology. Firstly the training generates awareness that Service Automation is becoming a necessity for almost every service provider and this in turn will spark discussion on how to digitize the current service offering. 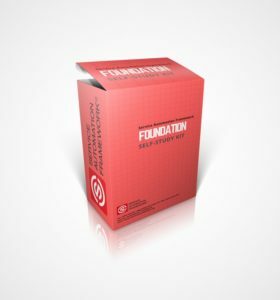 The certification will equip staff with the skills and techniques (such as Service Automation Blueprinting) to start Service Automation projects in the organization. 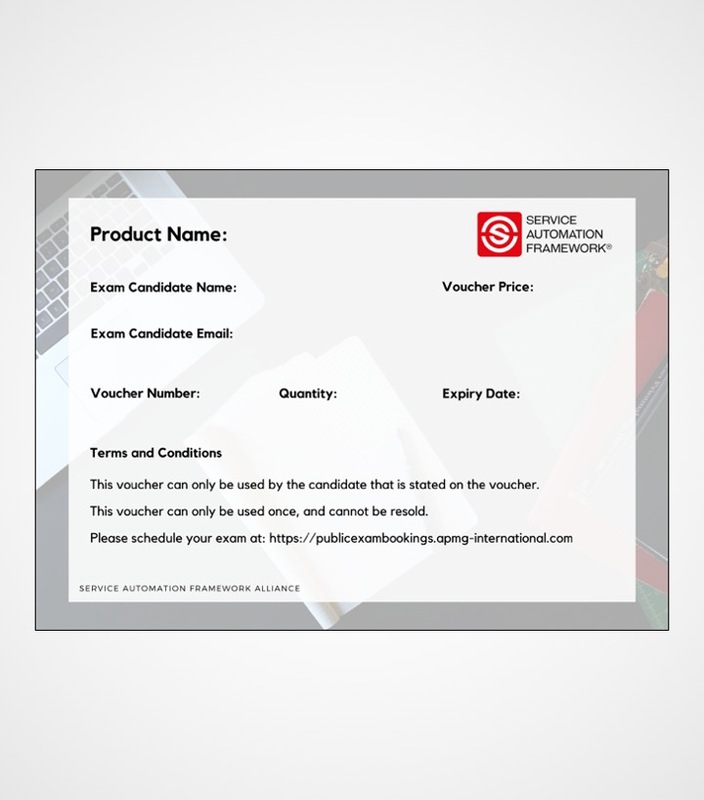 This exam can be taken online by purchasing this voucher. 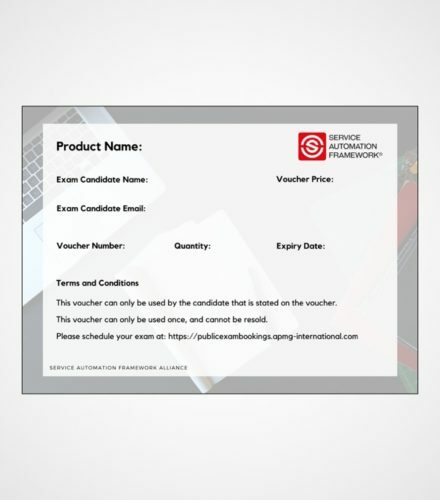 The voucher can be redeemed with APMG International. 40 minutes. Non-native English speaker will receive an additional 15 minutes to complete the exam.